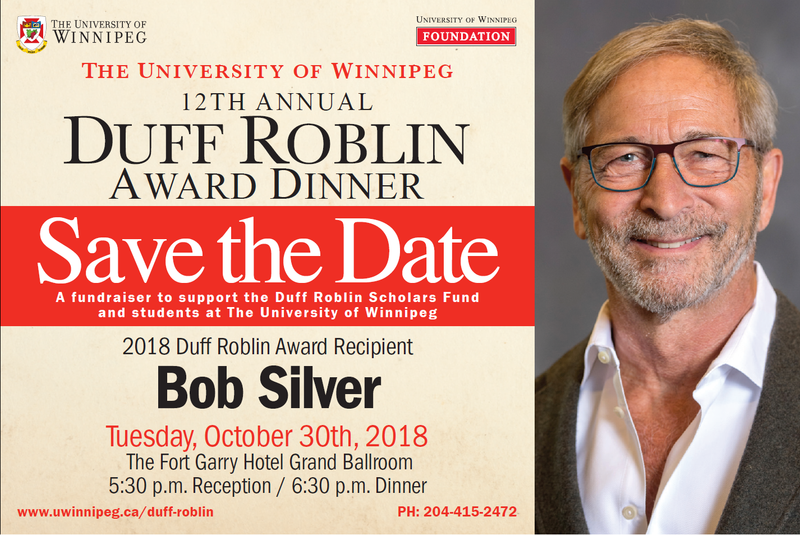 Join us for the annual Duff Roblin Award Dinner in honour of 2018 recipient Mr. Bob Silver, prominent businessman and Chancellor of The University of Winnipeg. A beloved UWinnipeg tradition in its twelfth year, this prestigious award pays tribute to former Premier and inaugural recipient, The Honourable Duff Roblin. It recognizes a recipient’s qualities as an outstanding Manitoban and patron of education who has demonstrated a lifelong commitment to the community. Proceeds from the event will support students at The University of Winnipeg, with a portion of the night’s proceeds directed to the Duff Roblin Scholars Fund, which provides Graduate Fellowships for students in UWinnipeg’s Master’s in Development Practice: Indigenous Development and Master of Arts in Indigenous Governance programs. In addition to individual tickets, sponsorship opportunities are also available at the Title, Platinum, Gold, Silver, and Corporate levels. For more information or to purchase, please see the event sponsorship package, or contact us by email at fdnevents@uwinnipeg.ca or through our event hotline at 204.415.2472. We are also looking for individual and corporate donors interested in donating a silent auction item or raffle prize. If you are able to donate a prize, please contact us by email or by phone at 204.415.2472.